The ultimate in an inflated girl's clubhouse! 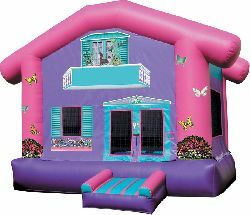 This beautiful Dollhouse bounce house rental is a favorite among little girls. The graphic details including butterflies on bushes, window shutters, a balcony and grand entrance are eye-catching and crowd-pleasing. This is a larger than standard bounce house.